The game was only half the story. Now you can step deeper inside the bloody truth behind Dante's most dangerous missions. And these cases are even more lead-filled and blood-drenched than the last. There's a demonic face behind the Mafia. A rock star siren who'd sell her soul for a hit song. A lowly fisherman who reels in a Satanically sinister catch. And a man who succumbs to dark purposes to fulfill a noble goal -- to shocking results. With more monsters, hotter babes, and more brutal battles, this is the most exciting anime series based on any game ever! 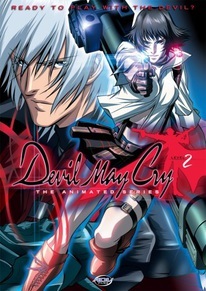 Don't miss part two of the awesome Devil May Cry animated trilogy!